When you’re a busy family, getting your mornings off to a good start can seem difficult, but it’s a crucial part of a productive day. When you get off to a great start, the rest of your day is bound to go well too, right? Even small changes to your morning routine can make a world of difference for you, or your family. 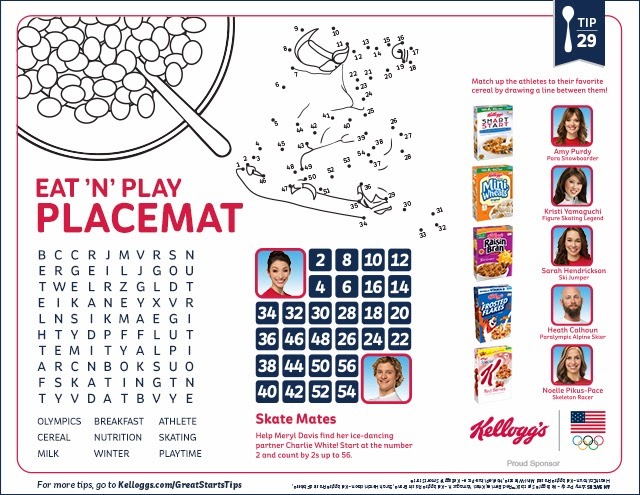 That’s why Kellogg’s and I are teaming up this winter to ensure we all get off to great starts - even the kiddies! Over the next few weeks, I’ll be sharing 'Tips For A Great Start with Team Kellogg’s', and letting you know how these valuable pieces of advice help me. Like learning to take out just few minutes to play with my daughter, and start our day with a little fun and activity with this printable Eat 'N' Play placement (click to download). It’s fun to complete, but also a great opportunity to bond with her! Check out more helpful tips from Team Kellogg's coming up soon!